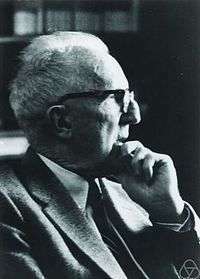 Harold Calvin Marston Morse (24 March 1892 – 22 June 1977) was an American mathematician best known for his work on the calculus of variations in the large, a subject where he introduced the technique of differential topology now known as Morse theory. In 1933 he was awarded the Bôcher Memorial Prize for his work in mathematical analysis. He was born in Waterville, Maine to Ella Phoebe Marston and Howard Calvin Morse in 1892. He received his bachelor's degree from Colby College (also in Waterville) in 1914. At Harvard University, he received both his master's degree in 1915 and his Ph.D. in 1917. He taught at Harvard, Brown, and Cornell Universities before accepting a position in 1935 at the Institute for Advanced Study in Princeton, where he remained until his retirement in 1962. He spent most of his career on a single subject, titled Morse Theory, a branch of differential topology. Morse Theory is a very important subject in modern mathematical physics, such as string theory. Marston Morse should not be confused with Anthony Morse, famous for the Morse–Sard theorem. "A fundamental class of geodesics on any closed surface of genus greater than one". Trans. Amer. Math. Soc. 26 (1): 25–60. 1924. doi:10.1090/s0002-9947-1924-1501263-9. MR 1501263. "The foundations of a theory in the calculus of variations in the large". Trans. Amer. Math. Soc. 30 (2): 213–274. 1928. doi:10.1090/s0002-9947-1928-1501428-x. MR 1501428. "Singular points of vector fields under general boundary conditions". Proc Natl Acad Sci U S A. 14 (5): 428–430. 1928. doi:10.1073/pnas.14.5.428. PMC 1085532 . PMID 16577120. "The critical points of functions and the calculus of variations in the large". Bull. Amer. Math. Soc. 35 (1): 38–54. 1929. doi:10.1090/s0002-9904-1929-04690-1. MR 1561686. "The foundations of the calculus of variations in the large in m-space (first paper)". Trans. Amer. Math. Soc. 31 (3): 379–404. 1929. doi:10.1090/s0002-9947-1929-1501489-9. MR 1501489. "Closed extremals". Proc Natl Acad Sci U S A. 15 (11): 856–859. 1929. doi:10.1073/pnas.15.11.856. PMC 522574 . PMID 16577255. "The foundations of a theory of the calculus of variations in the large in m-space (second paper)". Trans. Amer. Math. Soc. 32 (4): 599–631. 1930. doi:10.1090/s0002-9947-1930-1501555-6. MR 1501555. "The critical points of a function of n variables". Trans. Amer. Math. Soc. 33 (1): 72–91. 1931. doi:10.1090/s0002-9947-1931-1501576-4. MR 1501576. "Sufficient conditions in the problem of Lagrange without assumptions of normalcy". Trans. Amer. Math. Soc. 37 (1): 147–160. 1935. doi:10.1090/s0002-9947-1935-1501780-9. MR 1501780.
with Walter Leighton: "Singular quadratic functions". Trans. Amer. Math. Soc. 40 (2): 252–288. 1936. doi:10.1090/s0002-9947-1936-1501873-7. MR 1501873.
with Gustav A. Hedlund: "Manifolds without conjugate points". Trans. Amer. Math. Soc. 51 (2): 362–386. 1942. doi:10.1090/s0002-9947-1942-0006479-x. MR 006479. "Homology relations on regular orientable manifolds". Proc Natl Acad Sci U S A. 38 (3): 247–258. 1952. doi:10.1073/pnas.38.3.247. PMC 1063540 . PMID 16589087. Symbolic dynamics, Mimeographed notes by R. Oldenberger. Princeton, NJ: Institute for Advanced Study. 1966. ↑ Dresden, Arnold (1936). "Review: Calculus of variations in the large, by Marston Morse". Bull. Amer. Math. Soc. 42 (9, Part 1): 607–612. doi:10.1090/s0002-9904-1936-06362-7. ↑ Ahlfors, L. (1948). "Review: Topological methods in the theory of functions of a complex variable, by Marston Morse". Bull. Amer. Math. Soc. 54 (5): 489–491. doi:10.1090/s0002-9904-1948-09004-8. ↑ Smale, Stephen (1977). "Review: Global variational analysis: Weierstrass integrals on a Riemannian manifold, by Marston Morse". Bull. Amer. Math. Soc. 83 (4): 683–693. doi:10.1090/s0002-9904-1977-14345-0. Pitcher, Everett (1994), "H. Marston Morse" (PDF), in National Academy of Sciences of the United States of America, Biographical Memoirs, Biographical Memoirs, 65, Washington, D.C.: National Academy Press, pp. 223–240, ISBN 978-0-309-07359-2 . Bott, Raoul (1980), "Marston Morse and his mathematical works", Bulletin of the American Mathematical Society, New Series, 3 (3): 907–950, doi:10.1090/s0273-0979-1980-14824-7, MR 585177, Zbl Zbl 0469.01012 . O'Connor, John J.; Robertson, Edmund F., "Marston Morse", MacTutor History of Mathematics archive, University of St Andrews .